Experience the “hottest” and “coolest” attractions in Alaska! 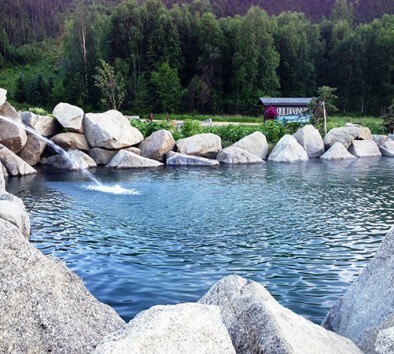 Start with a 60 mile ride to Chena Hot Springs Resort. Along the way learn about the recreational area and history of the 100+ year old resort. Be on the lookout for wildlife as this is moose country. Enjoy dinner and an Aurora Ice Museum Tour. Enjoy the “cool” tour of the largest year-round ice environment in the world made from over 1,000 tons of ice and snow. Relax on caribou covered ice stools at the Aurora Ice Bar. Enjoy an “appletini” (extra $15 fee and I.D. required) in your very own ice carved martini glass, your souvenir to take with you! See the beautiful ice chandeliers overhead and theme bedrooms as you take in your amazing surroundings. To end the evening, the choice is yours for either a “hot” dip in the natural outdoor hot springs rock lake (ages 18+) including a towel or take an educational Geothermal Energy Tour. Learn about the resort’s ongoing energy projects. Minimum age is 12. Minimum age is 18 for entry into the Hot Springs. Minimum height is 5’0″. Minimum weight is 100 lbs. Bring a warm coat, gloves, hat and swimsuit. Towels and a parka will be provided. Wildlife sightings are likely but not guaranteed. Time at Hot Springs & Ice Museum is approximately 3 hours.